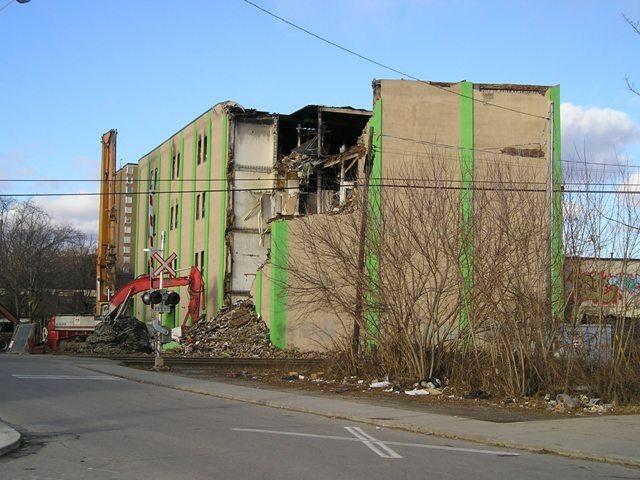 The Save & Secure Storage Facility at Pelham & Osler, early in the demolition proces, January 18, 2012. Earlier this month, a major fire effectively destroyed the Save and Secure Self Storage building at Pelham Avenue and Osler Street. While it is fortunate that nobody died in this fire (and to my knowledge, none of the local residents have permanently lost their homes), the building cannot be salvaged, and as such is being torn down. Early estimates put the damage at $1 million, although it can be difficult to assign a definite value to the possessions and memories which were lost in the fire. Forty-nine years ago, a fire struck the same neighbourhood with much more deadly consequences. In the early morning of February 8, 1963, a fire broke out in a family home on Miller Street, which runs north-south, one block west of where the Save and Secure building barely still stands. Headline from the front page of The Globe and Mail, February 8, 1963. According to newspaper reports, the family’s children were asleep upstairs while their father waited downstairs for the mother to come home from work; she worked the night shift for the post office (presumably at the building on the west side of Keele Street, between Annette and Dundas Streets), and her husband ritually waited up for her and greeted her with a cup of tea when she came in the door. That evening the father put the kettle on, but fell asleep on the couch. The father woke to find the house on fire and his children screaming for help from upstairs. Despite valiant rescue attempts by the father, his neighbour, and local police officers, all eight children in the family perished, making it the largest known loss of life in a fire for a single family in Toronto history, according to the Toronto Star. Although several nearby houses were also destroyed in the fire, the occupants were able to safely evacuate. Two police constables were also taken to hospital where they were treated for smoke inhalation. By evening, the story was on the front page of the Toronto Star, noting that community residents were already organizing a “Miller St. Fire Victims’ Fund” through the Davenport Home and School Association. By the next day, additional donation funds had been established, through the family’s church and through the father’s employer, Brewer’s Retail. 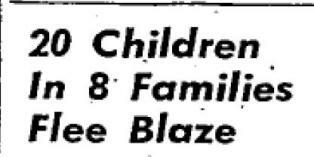 Headline from page 22 of the Toronto Star, February 12, 1963. The fire remained a major news story in Toronto over the next few days. The funeral for the eight children was held on February 11 at a Parkdale funeral chapel, and over 1,500 were reported in attendance, the crowd being a mixture of friends, neighbours, and Torontonians who were affected by the tragedy. For those who lived in the area at the time, the memory of this event remains strong. I have been asked about this particular fire by several neighbours as its fiftieth anniversary is approaching. One of the people I have spoken with about it specifically remembers that after the fire, her family was not allowed to make french fries in the house again. I expect to continue to collect information on this fire over the next few months, and will likely write a feature article on it for an upcoming issue of The Leader & Recorder, the quarterly newsletter of the West Toronto Junction Historical Society.